The Cowboys have re-signed Austin, Jon Machota of The Dallas Morning News reports. Austin played in only seven games in 2018, catching eight passes on 13 targets for 140 yards and two touchdowns while adding 55 yards on six carries on the ground. Austin (groin) does not carry an injury designation for Saturday's divisional-round playoff game against the Rams, David Helman of the Cowboys' official site reports. Analysis: Austing was a full participant in Thursday's practice after having been limited to begin the week. The 27-year-old is managing a groin issue that sidelined him for more than the first half of the regular season, and is on track to play through the injury versus the Rams on Saturday. Austin could see a slight uptick in snaps with Allen Hurns (ankle) now on injured reserve. Austin (groin) was a limited participant at Wednesday's practice. Austin (groin) was limited during Tuesday's practice session, Jon Machota of The Dallas Morning News reports. Analysis: Austin played through his groin injury in Saturday's wild-card win over the Seahawks, but he saw just nine snaps. His limited participation Tuesday bodes well for his ability to play in the divisional round against the Rams, though he may see limited snaps once again. Austin (groin) is expected to be a limited participant in Tuesday's practice, David Helman of the Cowboys' official site reports. Cowboys owner Jerry Jones said Tuesday on his weekly radio appearance on 105.3 The Fan Dallas that he's "very positive" about Austin's (groin) chances of playing Saturday's divisional-round matchup with the Rams, Jon Machota of The Dallas Morning News reports. Austin (groin) is active for Saturday's wild-card game against the Seahawks, Todd Archer of ESPN.com reports. Analysis: For the second week in a row, Austin will be available, despite a lingering groin injury. In Week 17, he earned 10 snaps on offense and two on special teams, which resulted in a measly one catch (on three targets) for 10 yards. Working behind a healthy Amari Cooper, Michael Gallup and Cole Beasley, it's difficult to expect much production from Austin. Austin (groin) has been deemed questionable for Saturday's wild-card game against the Seahawks, Curtis Crabtree of Sports Radio 950 KJR Seattle reports. Analysis: While Austin returned to the field Week 17 for the first time since Week 6 against the Jaguars, he's been held to limited participation in all three practice sessions this week. Even if he does suit up Saturday, Austin's primary contributions likely will come as a returner on special teams. Austin was a limited participant during Tuesday's practice. Analysis: Austin dealt with this injury ahead of Week 17's game against the Giants but ultimately suited up. 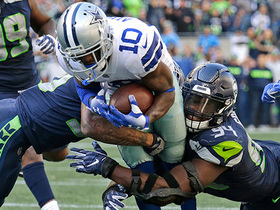 The Cowboys are likely exercising caution, and his practice status Thursday will be more telling of his availability for Saturday's playoff game versus the Seahawks. Austin (groin) won't carry an injury designation into Sunday's game against the Giants, Jon Machota of The Dallas Morning News reports. Analysis: Austin was a full participant at practice all week, clearing the way for his return from a nine-game absence. The Cowboys are already locked into the No. 4 seed in the NFC, so he could see more work than usual if the team opts to take it easy with more prominent receivers like Amari Cooper, Cole Beasley and Michael Gallup. Austin (groin) was a full practice participant Wednesday, Jon Machota of The Dallas Morning News reports. Austin (groin) has a chance to return Sunday at the Giants, Calvin Watkins of The Athletic reports. Analysis: Absent since Week 6 due to a strained right groin, Austin has increased his workload in recent weeks, maintaining limited listings on the Cowboys' last five injury reports. With the Cowboys waiving wide receiver Lance Lenoir in order to activate cornerback C.J. Goodwin (forearm) from IR, the team seems to be preparing for life with Austin again. How Austin fares in practice in the coming days will go a long way toward his availability Week 17. Austin (groin) is inactive for Sunday's Week 16 tilt against the Buccaneers. Analysis: Austin will thus fail to suit up for his eighth consecutive game. Not yet having returned to full practice participation, Austin presently seems like a very iffy proposition at best for the Week 17 finale against the Giants as well. Austin (groin) is listed as questionable for Sunday's game against the Buccaneers, Jon Machota of The Dallas Morning News reports. Analysis: Austin was a limited participant in Friday's practice and has yet to advance to full activity since suffering the right groin strain Oct. 14. With that in mind, he's no safe bet to gain clearance for the Week 16 matchup, and will likely hold only a limited role in the offensive game plan if he does dress for the contest. Austin (groin) was a limited participant in Thursday's practice, David Helman of the Cowboys' official site reports. Analysis: Since returning to on-field work last week, Austin has logged five consecutive limited practices. Because he hasn't played since Week 6, Austin may need to put in a full session Friday to have a good shot at ending his eight-game absence Sunday against the Buccaneers. Austin (groin) will be a limited participant in Wednesday's practice, Jon Machota of The Dallas Morning News reports. 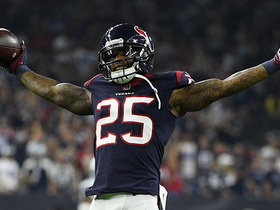 Austin (groin) is inactive for Sunday's game against the Colts, Brandon George of The Dallas Morning News reports. Austin (groin) is listed as questionable for Sunday's contest at Indianapolis, Jon Machota of The Dallas Morning News reports. Analysis: Austin practiced in a limited capacity all week, marking his first on-field activity since picking up a right groin strain Oct. 14. On Wednesday, he told Calvin Watkins of The Athletic that he's feeling "much better," which could help him serve as the Cowboys' punt returner and even earn a handful of offensive plays Sunday, if active. Austin (groin) practiced in a limited capacity Wednesday, Calvin Watkins of The Athletic reports. Head coach Sean Garrett said Austin (groin) is expected to return to practice on a limited basis Wednesday, David Helman of the Cowboys' official site reports. Analysis: Austin has been sidelined by a groin strain for roughly eight weeks, but his return to practice puts him on track to return to game action in the near future. However, there's no guarantee he'll be ready to go in time for the Cowboys' Week 15 date with the Colts this weekend. 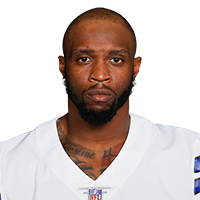 Austin (groin) is listed as out for Sunday's game against the Eagles, David Helman of the Cowboys' official site reports. Analysis: Austin has yet to even resume practicing since he suffered the right groin strain in an Oct. 14 win over the Jaguars, making it more and more likely that he might not play again this season. For now, the Cowboys will continue to take a week-to-week approach with the wideout, who won't have a prominent role on offense if he's able to make it back for any of the team's final three regular-season contests. Austin (groin) didn't participate in Thursday's practice, Calvin Watkins of The Athletic reports. Analysis: Austin has yet to take any meaningful step forward in his recovery since straining his right groin Oct. 14 against the Jaguars. With no practice reps in nearly two months, it seems unlikely that Austin will make it back for Sunday's game against the Eagles. Coach Jason Garrett said Austin (groin) won't practice Wednesday, Calvin Watkins of The Athletic reports. Analysis: Austin has already missed six consecutive games with the groin issue and has yet to resume practicing in any fashion, making it surprising the Cowboys have kept him on the 53-man roster this long. Unless he makes some unexpected progress in the next day or two, it'll be safe to pencil him in for another absence Sunday against the Eagles. Austin (groin) has been ruled out for Thursday's game against the Saints, David Helman of the Cowboys' official site reports. Analysis: Austin didn't practice in any capacity this week and will be sidelined for a sixth straight game. The 2013 first-round pick likely won't have a significant role on offense awaiting him even if he's able to make it back for any of the Cowboys' final four contests of the regular season. Austin (groin) isn't participating in practice Tuesday, Brandon George of The Dallas Morning News reports. Analysis: The 2013 first-round pick has yet to see the field since Week 6 due to the groin injury. With the Cowboys playing Thursday, Austin's availability is in serious jeopardy. Expect the team to make the official call later in the week, but if Austin can't go, Cole Beasley would likely serve as the team's primary punt returner. Austin (groin) isn't practicing Monday, Brandon George of The Dallas Morning News reports. Analysis: With Dallas facing New Orleans on Thursday in Week 13, it appears Austin is headed for a sixth consecutive absence. He'll likely serve as the Cowboys' fifth or sixth option at wide receiver if or when he eventually returns. Austin (groin) isn't participating in Sunday's practice, David Helman of the Cowboys' official site reports. Analysis: Because the Cowboys are preparing for a second straight Thursday game Nov. 29 against the Saints, the team is deviating from its normal practice schedule and holding a session over the weekend. Austin's absence suggests he's likely in line to miss a sixth consecutive contest, but the Cowboys will probably wait until Wednesday to officially rule him out. Once Austin puts the groin issue behind him, he'll likely have a minimal role on offense. Austin (groin) has been ruled out for Thursday's game against the Redskins, Jon Machota of The Dallas Morning News reports. Analysis: Considering Austin hasn't practice since mid-October, he never had a realistic shot of playing on a short week. With Austin demonstrating little evidence of progress to date in his recovery from the strained right groin, it's possible that additional absences will be in store for the wideout, who will sit out his fifth straight game this week. Austin (groin) was listed as a non-participant in Tuesday's practice, Jon Machota of The Dallas Morning News reports. Analysis: The Cowboys haven't indicated that Austin has made noteworthy progress in his recovery from the right groin strain this week, so he looks like he'll be sidelined for another game Thanksgiving Day against the Redskins. Dallas will provide final word on Austin's Week 12 status after releasing Wednesday's practice report. Austin (groin) has been ruled out for Sunday's game in Atlanta, Jon Machota of The Dallas Morning News reports. Analysis: Austin wouldn't have much of a role on offense even if he were healthy, presumably slotting in as the No. 5 receiver behind Amari Cooper, Michael Gallup, Cole Beasley and Allen Hurns. The speedy veteran hasn't played or practiced since Week 6 and doesn't seem likely to make it back for a Thanksgiving Day game against Washington in Week 12. Austin (groin) isn't participating in Thursday's practice, Brandon George of The Dallas Morning News reports. Analysis: The team hasn't provided any indication of late that Austin has made dramatic progress in his recovery from a right groin strain, so it's expected that he'll miss his a fourth consecutive contest Sunday in Atlanta. Official word on Austin's status for the game will come Friday, when the Cowboys release their final injury report for Week 11. Coach Jason Garrett said Austin (groin) wouldn't participate in Wednesday's practice, Brandon George of The Dallas Morning News reports. Analysis: Since straining his right groin in the Cowboys' Week 6 win over the Jaguars, Austin has yet to resume practicing in any fashion. Even if he's able to advance to limited participation by the end of the week, Austin's chances of playing Sunday against the Falcons appear slim. Austin (groin) will not play Sunday against the Eagles, Jon Machota of The Dallas Morning News reports. Analysis: Austin was unable to practice at all this week. The former Ram hasn't played since straining his groin Week 6 against the Jaguars. Austin's absence has mostly been felt on special teams, where Cole Beasley and Jourdan Lewis have found more work. Austin (groin) wasn't seen participating in Thursday's practice, Brandon George of The Dallas Morning News reports. Analysis: Austin has been sidelined since Week 6 with the right groin strain and has yet to return to practice in any capacity, putting him on track for another absence Sunday in Philadelphia. Once Austin is healthy again, he'll likely have a limited role as a gadget player on offense, with his bigger impact likely to come on special teams as a return man. Austin (groin) didn't practice Wednesday, Jon Machota of The Dallas Morning News reports. Analysis: Austin hasn't practiced in any capacity since Week 6 and probably won't have much of a role on offense even if he eventually gets healthy. Amari Cooper, Michael Gallup and Cole Beasley took most of the wideouts snaps in Monday's 28-14 loss to Tennessee, with Allen Hurns operating as the No. 4 option. Austin (groin) was ruled out for Monday's game against the Titans, Jon Machota of The Dallas Morning News reports. Analysis: Austin did not participate at practice this week and will miss his second straight game with the right groin strain suffered in Week 6. Even with the bye last week to aid in his recovery, the 28-year-old doesn't have a firm timetable for his return. Cole Beasley should take over punt return duties for the Cowboys in his absence. Austin (groin) didn't participate in Friday's practice, Turron Davenport of ESPN.com reports. Analysis: With back-to-back absences from practice to begin the week, Austin seems to be trending toward an inactive status for the Cowboys' second straight game. Even if Austin makes enough progress in his recovery from the groin strain in the next few days to suit up Monday against the Titans, his role on offense could be smaller than it had been previously after Dallas recently added Amari Cooper to its wideout ranks. Austin (groin) didn't practice Thursday, Brandon George of The Dallas Morning News reports. Analysis: Since Austin suffered a right groin strain Week 6, the Cowboys have played just one time (Week 7) due to having a bye in the schedule Week 8. With a Monday night matchup against the Titans on tap, the team has reconvened, albeit without Austin on the field. He'll have two more chances to prove his health this week, but his lack of activity Thursday isn't a great sign for his immediate availability. Austin (groin) will miss Sunday's game at Washington, but he hopes to avoid surgery, Brandon George of The Dallas Morning News reports. Analysis: With the Cowboys heading into a bye week after Sunday's game, Austin might have a chance to miss just the lone contest. 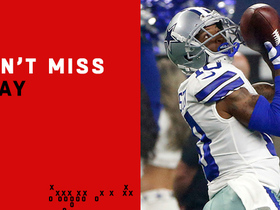 His absence shouldn't have too much impact on the Dallas offense in Week 7, as he's seen just 10 targets and six carries in six games this season. There could be a few more snaps available for Michael Gallup and Deonte Thompson while Austin is out. Austin (groin) didn't participate in Thursday's practice, Clarence E. Hill Jr. of the Fort Worth Star-Telegram reports. Analysis: Coach Jason Garrett had previously suggested it was unlikely Austin (groin) would suit up Week 7 against the Redskins, so the wideout's absence from practice Thursday was fully anticipated. Austin's status beyond this weekend seems to be the greater concern at this juncture, as the 28-year-old is soon scheduled to receive a second opinion on the injury that will offer clarity on his outlook. Depending on the severity of his right groin strain, Austin could be a candidate for injured reserve. Coach Jason Garrett said Austin would receive a second opinion on his strained right groin in the next day or two and noted that injured reserve could be a realistic possibility for the wideout, Brandon George of The Dallas Morning News reports. Coach Jason Garrett isn't optimistic Austin (groin) will play Week 7 against the Redskins, David Helman of the Cowboys' official site reports. Analysis: Austin's absence would open the door for rookie Michael Gallup to work in the No. 3 wideout role and either Cole Beasley or Jourdan Lewis to slot in as a returner. Austin has been used sparingly this season, catching just seven of 10 targets for 130 yards and two scores through six games. Austin sustained a strained right groin during Sunday's 40-7 win versus the Jaguars, Brandon George of The Dallas Morning News reports. Analysis: With three touches Sunday, Austin now has 13 on the season for 185 yards from scrimmage and two touchdowns. The Cowboys commence Week 7 prep Wednesday, at which point the team will be required to file an injury report. Until then, his status for next Sunday's contest at Washington will be up in the air. Austin has been ruled out of Sunday's game against the Jaguars due to a groin injury, David Helman of the Cowboys' official site reports. Analysis: Prior to his departure, Austin made his usual minor impact on offense, taking two carries for 14 yards and hauling in his only target for five yards. He also returned one punt for three yards. 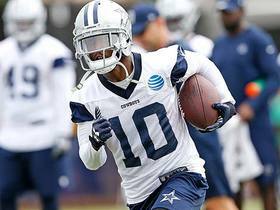 Along with fellow wide receiver Brice Butler (groin), Austin will head into the upcoming week with an injury of unknown severity. Austin caught one of three targets for a 44-yard gain during Sunday's 19-16 loss to Houston. Austin (shoulder) returned to Sunday's game against the Lions, Clarence E. Hill Jr. of the Fort Worth Star-Telegram reports. Analysis: Austin initially exited the Week 4 contest midway through the first half, but he has now managed to return. The deep-threat receiver will hope to provide a spark to Dallas' offense with his return. Austin is questionable to return to Sunday's game against Detroit due to a shoulder injury, Jane Slater of NFL Network reports. 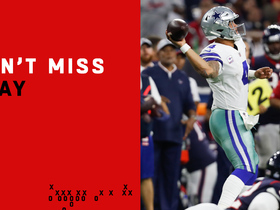 Analysis: Austin suffered a shoulder injury while attempting to reel in a deep end-zone pass from quarterback Dak Prescott, but he was unable to make the catch. If the big-play wideout is unable to return to the Week 4 matchup, expect an update on his health following the game. Austin caught all three of his targets for only two total yards in Sunday's loss to the Seahawks, but he turned one of them into a three-yard touchdown and added 18 yards on his only rushing attempt. Analysis: Despite showing he can take the top off a defense with his speed last week against the Giants, all of Austin's touches Week 3 came at or behind the line of scrimmage on bubble screens and jet sweeps. Until offensive coordinator Scott Linehan finds more creative ways to get him the ball, Austin isn't likely to make a consistent impact for the Cowboys. Austin caught both his targets for 79 yards and a touchdown while adding one carry for 15 yards in Sunday night's win over the Giants. Austin was on the field for only 10 offensive snaps in Sunday's loss to the Panthers, failing to see a target and rushing the ball once for one yard. Analysis: Despite all the big preseason talk of Austin being the Cowboys' version of Tyreek Hill, his actual debut with the team was a complete dud. His role could increase as the season wears on and offensive coordinator Scott Linehan tries to find some big-play weapons for Dak Prescott, but given the lack of impact Austin had in five years with the Rams, it's unlikely he'll make much of a splash in Dallas. Austin (hamstring) is expected to play in Sunday's preseason game against the Cardinals, Clarence Hill Jr. of the Fort Worth Star-Telegram reports. Analysis: Austin, who recently missed about a week's worth of time due to a bum hamstring, is practicing Friday, per Jon Machota of The Dallas Morning News. While the 2013 first-rounder remains a leading candidate to return punts and kickoffs for the Cowboys this season, Austin is buried on the depth chart offensively and isn't a good bet for consistent fantasy production from the outset of the upcoming campaign. Austin (hamstring) is expected to participate in practice this week, Jon Machota of The Dallas Morning News reports. Analysis: Last Wednesday, Austin left drills with what was later termed a tight hamstring, which sidelined him Saturday versus the Bengals. With a return to practice imminent, he seems in line to make his presence felt in the Cowboys' third exhibition Sunday against the Cardinals. However, like teammate Cole Beasley (groin), Austin may have to practice in a full capacity before getting the all-clear for game action. Austin (hamstring) will not play in Saturday's preseason tilt against the Bengals, Jon Machota of the Dallas News reports. Analysis: As expected, the Cowboys will keep Austin sidelined for Week 2 of the preseason as the team doesn't need to risk his long-term health at this point. 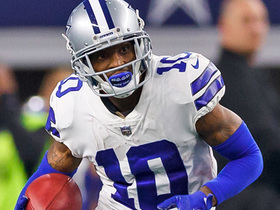 Fellow receiver Cole Beasley (groin) has also been ruled out, leaving room for rookie Michael Gallup to see additional reps with the first-team offense alongside Terrance Williams and Allen Hurns. Austin (hamstring) is unlikely to play in Saturday's preseason game against the Bengals, Brandon George of The Dallas Morning News reports. Analysis: Coach Jason Garrett called Austin -- who was injured during Wednesday's practice -- day-to-day. At this stage of the preseason, however, we suspect the Cowboys will play it safe with their new offensive weapon and instead take the opportunity to further evaluate younger and/or roster-bubble players. Austin departed Wednesday's practice session due to hamstring tightness, Jon Machota of The Dallas Morning News reports. Analysis: Cowboys owners Jerry Jones clarified after practice that Austin's injury "didn't seem serious" and suggested that the 27-year-old's early exit was precautionary. Austin is aiming to find a role within the first-team offense this season, with most of his reps likely to come at wideout after the Cowboys briefly pondered deploying him out of the backfield when he was initially acquired in late April. He'll have a couple of days to rest up before Saturday's preseason contest against the Bengals. Austin spent a lot of time at wide receiver with the first-team offense Thursday during the first practice of training camp, NFL.com's Gregg Rosenthal reports. Cowboys offensive coordinator Scott Linehan said he primarily views Austin as a receiver, Brandon George of The Dallas Morning News reports. "We'll use [Austin] for a lot of things, but he's a receiver first." said Linehan. "He's really in a lot of ways, some of his skill set is as an outside receiver, which is really unique, but he can move around, the slot." Austin will be used as a "web back" in Dallas, a role similar to the one Lance Dunbar previously held with the team, Clarence Hill Jr. of the Fort Worth Star-Telegram reports. The Rams have traded Austin to the Cowboys for a sixth-round draft pick, Adam Schefter of ESPN reports. Austin restructured his contract and will remain with the Rams, Gary Klein of The Los Angeles Times reports. Analysis: It was rumored that Austin would either seek a trade or release at the beginning of the new league year, but the longtime Ram will remain in Los Angeles for at least the immediate future. The 27-year-old saw a major drop in pass-catching production in Sean McVay's offense last season, recording 13 receptions for 47 yards. However, Austin did see a career-high 59 rushing attempts for 270 yards and one score. The Rams will either trade or release Austin before the start of the league year, a source has told Mike Garafolo of NFL Network. Analysis: Austin has come nowhere near his No. 8 overall status from 2013, never posting more than 509 receiving yards in five NFL seasons while typically being used more as a gadget-play guy or big-play specialist. Although the Rams finally put together an exciting offense in 2017, Austin was even less a focal point, totaling an ugly 47 receiving yards to go with 270 rushing yards while suiting up in all 16 games. It appears his time with the Rams may be done. Austin received just two offensive snaps and wasn't targeted during Saturday's 26-13 loss to the Falcons in the wild-card round. Austin rushed four times for 24 yards and caught three of five targets for 14 yards in Sunday's 34-13 loss to San Francisco. Austin rushed 10 times for 44 yards during Sunday's 42-7 win over Seattle. Analysis: The speedster's first carry came in the second quarter with the Rams ahead 13-0, and then he didn't touch the ball again until the game was entirely out of hand in the third quarter. Austin still only saw the field for 14 of 71 offensive plays, and he didn't receive a target for a second consecutive week. As a result, there aren't many fantasy settings where he should be relied on, especially at this stage of the season. Austin had one carry for six yards and had negative-nine receiving yards and a lost fumble in Sunday's loss to the Eagles. Analysis: Austin actually wasn't targeted by Jared Goff in the game, but the receiving yards and lost fumble came on the final play of the game as the Rams used laterals as a last ditch effort, and Austin was the unlucky man. The 26-year-old speedster continues to have a minimal impact despite the Rams' revamped offense, and has yet to reach 50 yards from scrimmage in a game this season. Austin rushed three times for eight yards and failed to haul in his lone reception during Sunday's 32-16 win over Arizona. Austin carried the ball five times for 17 yards and caught three passes for a loss of a yard during Sunday's 26-20 win over the Saints. Analysis: The catches tied a season high and snapped a three-game catchless streak for the former first-round pick. The Rams are trying to find ways to use the unique skillset of Austin and he saw 27 offensive snaps on Sunday, but he just doesn't really fit in with what new head coach Sean McVay is trying to do. Austin has four times as many carries as catches this season and -- despite all that speed -- is averaging just 4.5 yards per touch and has two plays of 20 or more yards this season. Austin played only 11 of 66 offensive snaps and rushed twice for just five yards during Sunday's 33-7 win over Houston. Austin rushed six times for 34 yards and finished with nine receiving yards during Sunday's 51-17 win over the Giants. Analysis: Austin wasn't credited with a target or reception in the contest and now has just seven catches for 43 yards this season. The speedster has done most of his damage on the ground with 31 carries for 169 rushing yards and a score. It's unlikely his involvement in the offense increases moving forward -- especially with the Rams averaging the most points per game in the league. As a result of his limited role, Austin is extremely difficult to rely on in the majority of fantasy settings. NFL Network's Mike Garafolo explains why the Dallas Cowboys are re-signing wide receiver Tavon Austin. Dallas Cowboys quarterback Dak Prescott evades Houston Texans defensive end Watt for a 44-yard heave to wide receiver Tavon Austin. Dallas Cowboys wide receiver Tavon Austin slips defenders on a 22-yard punt return. 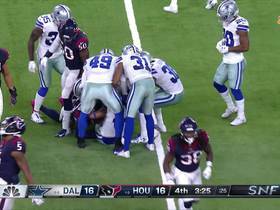 Houston Texans safety Kareem Jackson picks off Dallas Cowboys quarterback Dak Prescott's deflected pass. 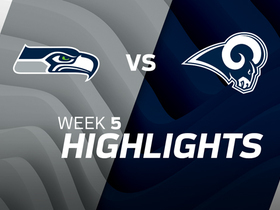 Check out highlights from the Week 5 matchup betweeen the Seattle Seahawks vs. the Los Angeles Rams in 2017. Dallas Cowboys quarterback Dak Prescott flips a shovel pass to wide receiver Tavon Austin for a 3-yard touchdown. 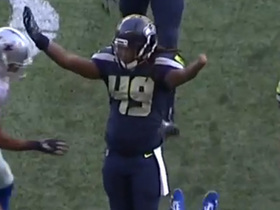 Seattle Seahawks linebacker Shaquem Griffin comes up with a tackle on special teams and head coach Pete Carroll loves every second of it. 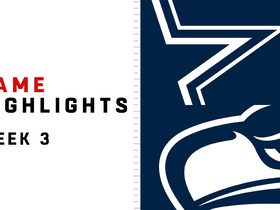 Watch the best plays from the Week 3 match up between the Dallas Cowboys and the Seattle Seahawks. Dallas Cowboys quarterback Dak Prescott uncorks 64-yard TD to wide receiver Tavon Austin. NFL Network's Gregg Rosenthal has the latest on early position battles within the Dallas Cowboys.